Free printable daycare forms will make running your in-home daycare even easier. Simply print and use immediately. Field trip forms are mandatory if you are taking the children on any type of trip.You must have the parents sign in writing that their child(ren) have permission to go. Parents need to be given this form in advance of any planned field trips. A simple fill in the blank form lets parents know where and when you are planning to go. Make sure each parent has signed the form prior to the trip. Hand out reminders to the parents before the planned trip. Once the children realize their is a field trip planned... they will be very excited about it. Double check to make sure all field trip forms have been turned in. This is my collection of field trip release forms. The first couple are general forms and can be used for any type of trip. Simply fill in the blanks to let the parents know the details and have them sign and return the bottom of the form prior to field trip day. The second section of forms are for specific field trips. Choose the one that fits your planned trip and just fill in the blanks. Simply fill in the blanks for your field trip destination. 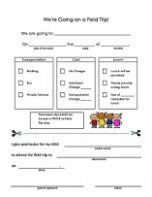 Lets parents know where you are going and when with a simple form for them to sign. A simple form to give the parents all the information they need. Just check the boxes and fill in the blanks. Parents will sign the bottom of the form and return that portion to you. Are you planning a specific field trip? Here are some simple fill in the blank forms for field trips to a pizza parlor, park, zoo or bakery. Simply print and use! Check out the daycare tips section for lots of helpful home daycare articles.